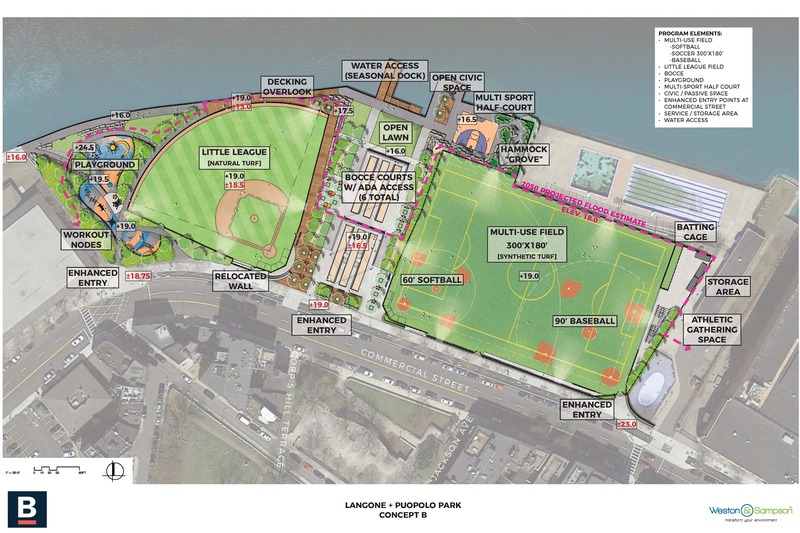 At Langone Park and Puopolo Playground, located along Boston Harbor in the North End neighborhood of Boston, Weston & Sampson is implementing innovative open space climate resilience design. This is the first project within the Boston park system to integrate the standards set forth by the city within the improvements program and mitigate future flooding. Langone & Puopolo has a rich and dynamic history spanning more than a century as one of the oldest parks in the Boston Parks and Recreation system. From its initial use as the North End Beach and the site of the Great Molasses Flood in 1919 to its current use, Langone and Puopolo has always been a key asset that serves not only the North End neighborhood but also the greater Boston community. 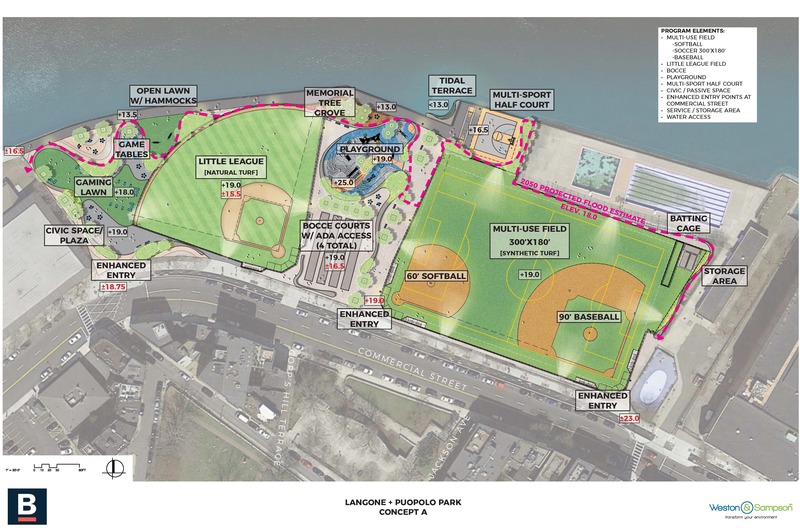 Currently comprised of a children’s playground area and walkways, basketball court, bocce courts, Little League baseball field, and a multiuse rectangular field with softball and baseball overlays, Langone & Puopolo is the only recreational open space with athletic fields in the North End. The property also includes a significant length of the Boston’s HarborWalk corridor, a key link that connects Charlestown and Downtown Boston. While some park assets were renovated over the decades, several key elements of the 4.5-acre park have deteriorated considerably over time. Most notable is the seawall that separates the park land from Boston Harbor. As climate change and sea level rise become more prevalent and a key challenge to waterfront cities like Boston, open space assets like Langone & Puopolo have been identified as cornerstones to the protection of the city’s edge. Currently, a large section of Langone & Puopolo’s harbor edge is inundated during large storm events and astronomical tides. This project aims to be ground zero for the implementation of open space climate resilience design, serving as a blueprint for future projects. Additional park improvements include reconstructing the Little League field, replacing and improving the multi-use field with a synthetic turf field, relocating and expanding the playground area, expanding and improving the bocce courts, raising and improving the HarborWalk, creating a new neighborhood memorial garden, and significant improvements to the stormwater management system, including relieving pressures off the overburdened stormwater system that is located offsite. Amenities include modern and efficient sports and pedestrian lighting, paved walkways and plaza spaces, site furnishings, and extensive tree and landscape planting areas. The totality of these elements is certain to yield an award-winning design for the North End. Posted in Newsletter and tagged langone and puopolo, newsletter.